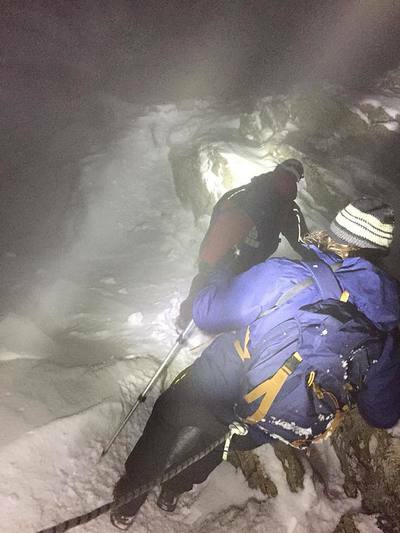 At the risk of appearing to be harping on about winter conditions (see our last post) we've just read a report of another rescue from the high fells, this one on Helvellyn where Patterdale MRT were out until well into the night rescuing two walkers from Striding Edge. The team were out from early afternoon until well into the night rescuing two walkers from high up on Striding Edge. More details later. For the avoidance of any doubt, Helvellyn is in full winter conditions. You should check the LDNP fell top report before heading out. You will require ice axe, crampons, map and compass and the skills to use these. Exposed routes above the snowline  such as Striding and Swirral Edges  are now in winter condition, especially on and nearing their exits. Therefore they should only be attempted by those experienced in, and equipped for, winter mountaineering including an ability to assess the stability, or otherwise, of the snowpack. And that's the key message. There is lots of walking in the Lakes, even in the winter, and we've got lots of of ideas for you to explore on our walks page, but if you're thinking of going out on steep slopes above the snow line then please ensure you're properly equipped and have the necessary experience otherwise you could join the list of those the volunteers of the Lake District mountain rescue teams have to rescue every winter.